We were invited to attend Cook.Eat.Drink.Live, yet another food event. It seems like these are popping up every other week these days (in NYC). Held at The Tunnel/La Venue, there was a room for wine tasting, a long corridor of food tastings, and two stages with scheduled demos. There was also one room that seemed to be dedicated to a few Italian products and an Italian restaurant but that room was fairly empty. I guess I’ll point out a few highlights, though it’s not really saying much here. Some parts of this event felt like a mini version of the Fancy Food Show (an industry food convention meant for buyers to taste products) but seriously, I can’t remember most of the products anymore. It was that exciting. 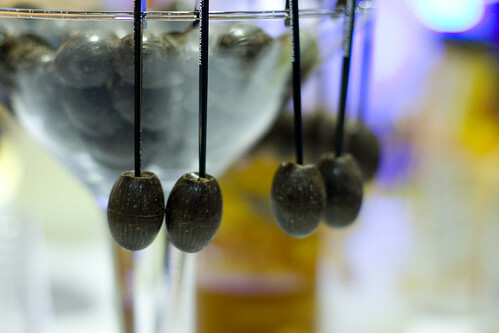 We saw these Cholives, chocolate truffles shaped like olives and stuck on plastic sticks that can hang off martini glasses. It’s a cute concept and the chocolates were good enough. 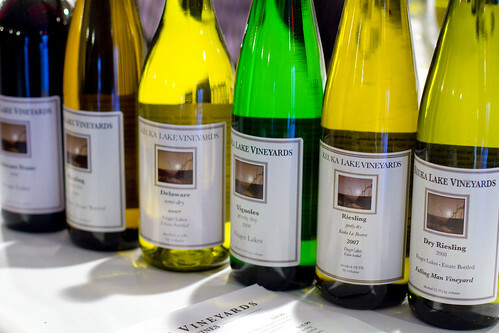 While most of the wines we tasted bored us (we tasted from roughly 4 or 5 wineries and there was a lot so we could have made bad choices), Keuka Lake Vineyards had some distinctive Rieslings and Vignoles. Their style seems to be light but we were particularly impressed with their Goldman Vineyard (one of their three) 2008 Dry Riesling. 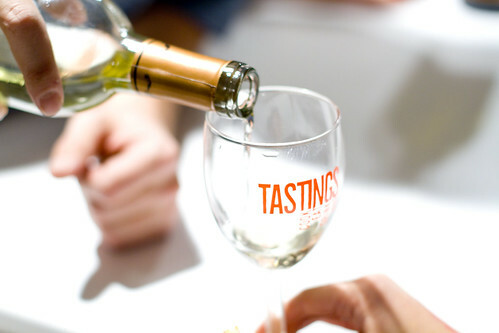 It’s not out on the market yet, but we’re excited to try pairing this spicy white. It’s always hard for restaurants to serve at events like this, cooking on little plug-ins or keeping stuff in chaffing dishes, so we weren’t surprised to be tasting cold or over-cooked food most of the time. 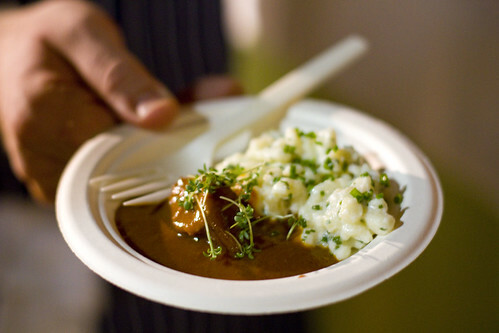 We have to give kudos to Chef Wolfgang Ban, from Seasonal Restaurant and Weinbar (not a typo), for his Braised Veal Cheeks and Spaetzle. Braised food is a good choice because it reheats well and it was all served hot. Technicalities aside, it was all very flavorful, a rich meaty goulash sauce with a mildly tangy sour cream soft speatzle. Though it was a sample size it was a complete plate and Lon is interested in trying the restaurant now so perhaps a full review is coming. 2 hours later, I was full, burping sparkling wine, and sick of squeezing through the bridge and tunnel crowd. We couldn’t help but feel bad for those who paid for this event. At $65 per ticket, you could probably drink your money’s worth, but free wine tastings are not hard to find. I also can’t help but compare this to New Amsterdam Market, which was free and had better vendors, making me feel like this event was really more about quantity than quality. posted by jessica	at 09:46 AM	Filed under Drinks, Events, Products, Wine. You can follow any responses to this entry through the RSS 2.0 feed. Both comments and pings are currently closed. The event sounds like a let down, but your new camera is working beautifully! Those chocolate olives are really cute. Jean, thanks, we’re so happy with it. Kalyan, I didn’t know you were undecided. Care to elaborate on your thoughts? Those cholives looks so divine. The Briased Veal Cheeks looks so delicious as well. I wish I had the chance to attend, although I really don’t drink–I just cook with it. Thanks for posting this. Very enjoyable. I admire the creative mind behind the cholives. I thought the event was great. True it was crowded and at times it was hard to maneuver – but that is just a testament to how many people attended and lingered. I too enjoyed Seasonal’s veal and speatzle. I also enjoyed the meat vendor who offered samplings of steak. The whoppie pies where tasty. But the highlight of the day had to be getting a chance to meet Ted Allen. Caren, meeting Ted Allen would definitely have upped the enjoyment factor for me. Kalyan, red give me a headache but white doesn’t. Do both give you headaches?